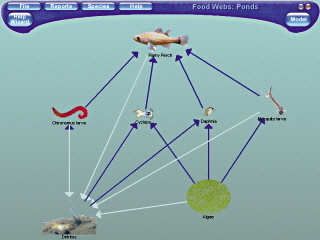 Construct food chains and webs with up to 45 different species. 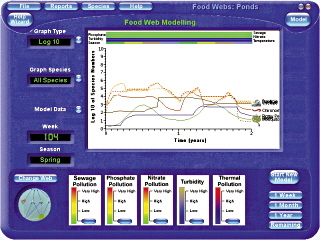 The powerful interactive software will model the interactions between the different populations over the course of time. This software package was designed for project-style student investigations. Levels of environmental variables may be set, such as sewage, turbidity, thermal pollution and phosphate and nitrate levels. During modeling new species may be introduced to model a changing ecosystem. The data that is generated can be displayed as various forms of graph including biomass pyramids. With the Full Environment and Species Editor you can add your own species. 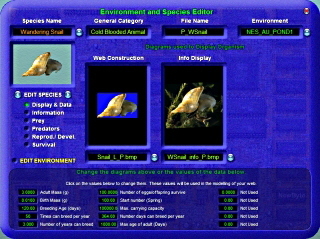 The physical attributes of the species can be edited to match your own pond and your own pictures can be added into the software. You can even exchange new species within your class or around the world.